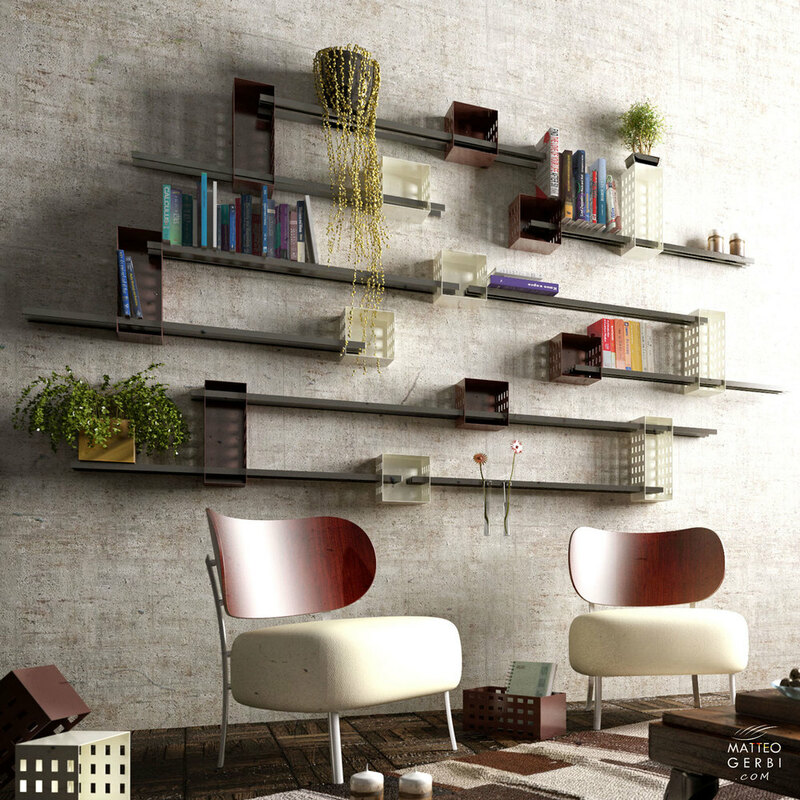 RayShelf™ is an unprecedented shelving system, designed by the Italian architect Matteo Gerbi. The motivation for the design was to create a practical, functional object for walls that doubles as a fully customisable art installation. Through different combinations of the variously-shaped support units, and a plurality of bars, which replace the classic board design, the user may create numerous arrangements to suit specific needs, spaces and aesthetic tastes. RayShelf™ is entirely manufactured in the UK. Its durability guarantees longevity, a fact that is additionally supported by the Ray Shelf™ʼs flexibility: multiple configuration possibilities remove the need for new products as rooms evolve. Ray Shelf™ is entirely designed and manufactured in the UK. Its lightweight design means that the volume of materials used is low, and these materials are, furthermore, entirely recyclable. “An innovative design is like an invention; its feature is not its shape or colour but its original way of working. If you want something innovative you have to invent it.” This is Matteo Gerbi's design approach for RayShelf™ as well as other products. The concept design is simple and unique: two or more slim lightweight metal bars, inserted between steel rectangle, square, circle, triangle or ellipse supports, form the shelf. Essentially the classic board, normally used to form the shelf, is replaced here by a plurality of bars. Thanks to this concept, RayShelf™ can be adapted to fit any space, creating different arrangements and combinations to suit a specific user's need. 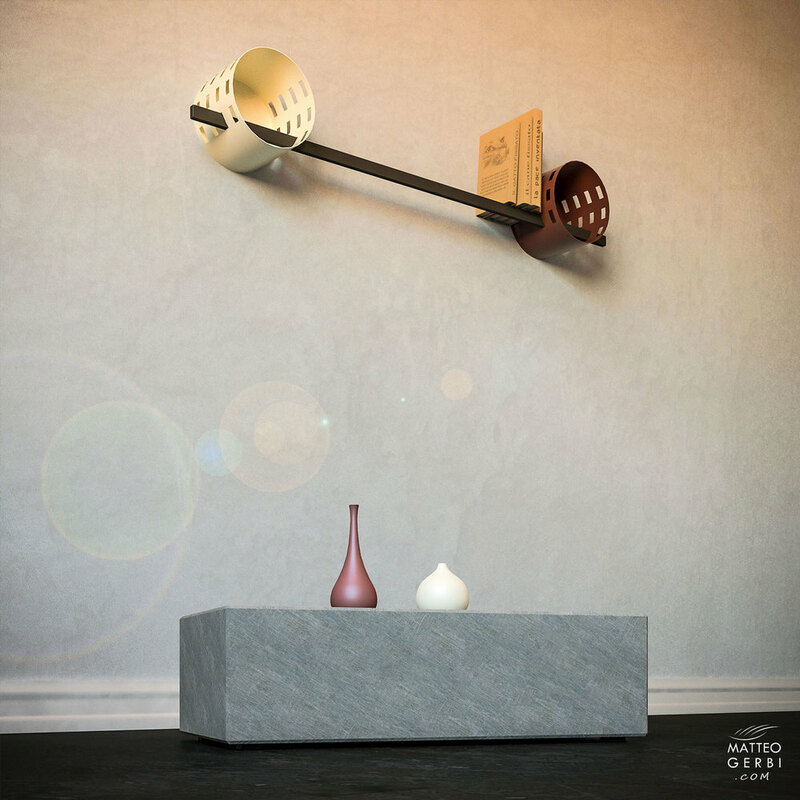 Ray Shelf™ has been designed and conceived as an art installation based on the visual representation of rays of light that are passing through a surface linking together colourful geometric forms. The first collection of Ray Shelf™ presents primary and secondary colours. The choice of using those colours comes from the idea that the objects, linked together from rays of light, reflect on their surface the spectrum of the light. RayShelf™ first collection comprises colourful shapes. A limited series was produced and now sold-out. Click here for more info about the Ray Shelf first Collection. RayShelf™ second collection comprises two elegant and neutral colours, Oyster White and Chestnut Brown, that fits any environment and style.